Here is your chances to participate in india’s biggest dance reality show dance kerala dance (dkd) coming soon on zee malayalam channel. 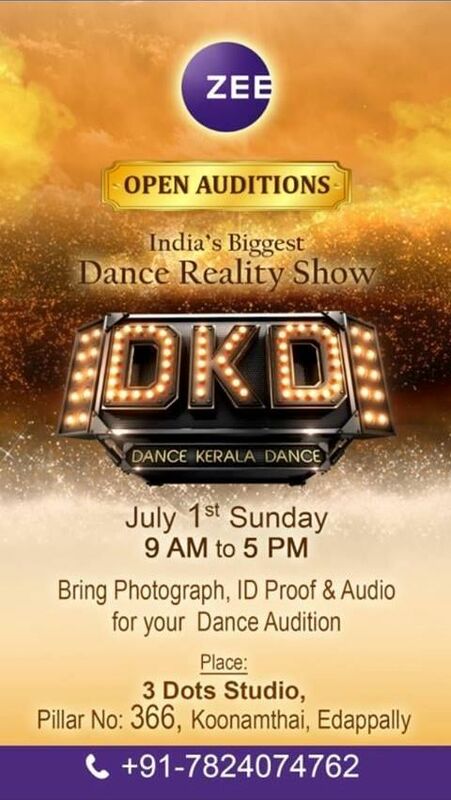 zee network’s malayalam channel invites you to participate in the open auditions for dkd reality show. Sunday, 1st July 2018 at 9.00 A.M to 5.00 P.M is the time and 3 Dots Studio Edappally is the Venue. Interested candidates should bring Photographs, ID proof, Audio for the dance reality show auditions. Logo launch of zee kerala channel will be on august, venue will be at trivandrum or kochi. Keralatv.in have already updated about the launch of zee network’s malayalam tv channel, it’s name not decided yet. it will be zee malayalam or zee kerala, zee keralam or any other. Zee planning to bring malayalam gec during 2018 onam season. 5 tv serials will be on the channel, it’s filming started already. popular mini screen artists are appearing for all zee malayalam serials. dr. s janardhanan is now working for a television serial. Zee network already purchased latest film rights of super hit malayalam films. Aaasif ali starring B-tech, Dileep movie Professor Dinkan etc are some of them. Manju warrier starring Aami, Mohanlal also added to zee malayalam channel movie library. Jayaram starring daivame kai thozham kekkumar akanam, vikada kumaran, Diwanjimoola Grand Prix, fahad fassil starring carbon Nivin Pauly’s Hey Jude etc are some of the other films. zee malayalam will be available through all leading cable tv and dth platforms. stay tuned here for more updates about malayalam television channel news.